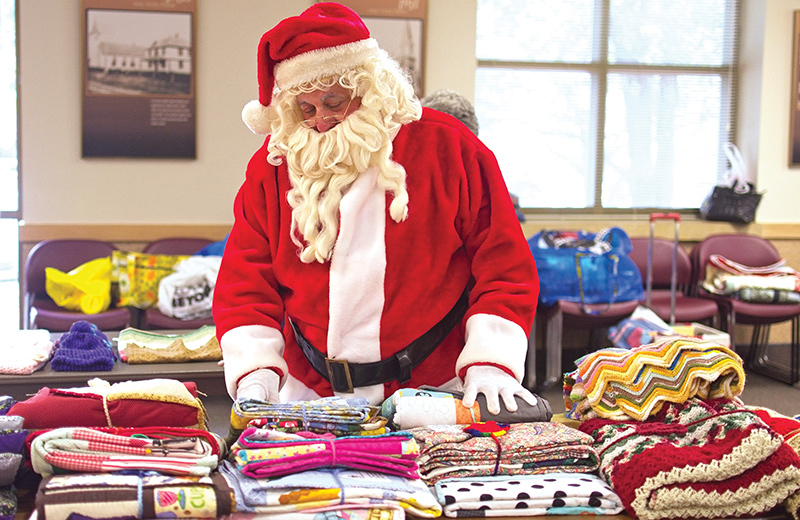 Chuck Fortunato in the guise of Santa admires the many prayer quilts crafted by the Trinity Threaders waiting to be blessed. LENEXA — Even when he’s not wearing his Santa suit, Holy Trinity parishioner Chuck Fortunato is channeling the spirit of St. Nicholas. Outgoing, generous and full of holiday cheer, he actually has an app on his phone to ensure he watches every Hallmark Christmas movie. Fortunato loves people and has the Italian gift for lighting up a room with his personality. Raised in a devout Catholic family in Milwaukee, Fortunato has fond memories of working with his brother Jimmy in their parents’ Italian restaurant. Playing Santa brought the brothers even closer. Jimmy played the starring role, and Chuck served as his understudy. In 2000, Fortunato made a career change which led him to Kansas City. “I wanted to do something to help people,” he said. So he opened Chuck’s Mobility, a business that provides home mobility products. Jimmy entrusted the Santa suit to his brother, so Fortunato could continue performing for friends and charities. And that’s what he’s done for almost 20 years. But Fortunato’s cheerful spirit was recently challenged when his dad died in March, just three years after the death of his mother. Then this past year, Jimmy was stricken with cancer. “With my parents,” said Fortunato, “I was more prepared. It was if all joy was being sucked from his life. Fortunato didn’t know if he could ever play Santa again. Just a little over a year ago is when they learned the news. And the prognosis wasn’t good. From that point on, Fortunato found it difficult to concentrate on anything but the devastating news. “My mind was so scattered,” he said. “I just kept thinking there’s nothing I can do! I’ve got to leave it in the hands of the doctors. But Fortunato had fallen away from the church when he left home and hadn’t attended Mass in many years. “I really don’t know why,” he said. “It’s like being married for years and falling out of love. When exactly did it happen? A friend suggested Fortunato might find solace in the Holy Trinity eucharistic adoration chapel, where he could go at any time. “It was just a real peaceful place,” Fortunato said. “That’s what got me in there. “I was grasping. I thought maybe praying would help. Fortunato said prayers he remembered from his youth. He read books available in the chapel, picking out a message or lesson to reflect on. “I went there virtually every single day for 60 days straight,” he said. “I had no idea what I was doing. In the foyer outside the chapel, Fortunato noticed prayer quilts hanging with an invitation for adorers to tie knots and pray for the needs of recipients. “I thought it was amazing that so many people pray for someone they don’t know,” he said. The Trinity Threaders, who make the quilts, heard about Jimmy and had a quilt delivered to Fortunato. He took it to the hospital on his next trip to Wisconsin. Jimmy was overwhelmed by the gesture — a quilt filled with prayers. Fortunato took a picture of Jimmy wrapped in the prayer quilt, with his hand on his heart. When he returned to Kansas, Fortunato decided to start going to Mass again. Then one day, when exiting church, he noticed the Threaders were having a craft sale. Indeed. Karen Boyd, who made Jimmy’s prayer quilt, just happened to be working the craft sale at that moment. When Jimmy died on Sept. 12, his body was cremated, and his family wrapped his urn in the prayer quilt he had come to treasure. After laying his brother to rest, Fortunato continued to pray, do eucharistic adoration and attend Mass, relying on his renewed faith to help him cope with the loss. The week of his brother’s birthday this October was particularly hard. After praying for the repose of Jimmy’s soul that Sunday, Fortunato left Mass to find the Threaders again — this time having their annual Christmas quilt raffle. “And I happened to be there again,” said Boyd. “Chuck told me the story about his brother’s ashes and the quilt being wrapped around the urn. Chuck offered a donation to the Threaders out of gratitude. “I really feel like they do such a great thing,” he said. But the Threaders insisted he fill out raffle tickets. That evening, Fortunato got a call telling him he’d won the Christmas quilt. Though he thought grief would make it difficult for him to play Santa this year, winning the quilt gave him a reason to try. A month after the Christmas-quilt raffle, the Threaders had a party to celebrate their 10-year anniversary. And Santa Claus dropped by to thank them for all the generous work they do. “It was really fun,” said Fortunato. “They had no idea Santa had won the Christmas quilt. Fortunato continues to grieve for his brother, but finds solace now in his church. He recently registered as a member of Holy Trinity and looks forward to getting more involved, forming a new family. Chuck is one of the most wonderful people I know. He is in a business that helps people who truly need it; and Chuck is utterly reliable, always putting himself out for his clients. Until I read this article, I didn’t know about the Hallmark thing–but it makes perfect sense! Chuck has such a sweet, sentimental nature, Hallmark movies are right up his alley. I am touched to learn that renewing his faith has brought Chuck some solace after the death of is brother…and happy for him. Thank you for an inspiring article.